Vintage Crime/Black Lizard, 9780307275448, 352pp. Since a mysterious childhood illness, Harry Wilkes has experienced horrific visions. Gruesome scenes emerge to replay themselves before his eyes. Triggered by simple sounds, these visions occur anywhere a tragic event has happened. Now in college, Harry feels haunted and turns to alcohol to dull his visionary senses. One night, he sees a fellow drunk easily best three muggers. In this man, Harry finds not only a friend that will help him kick the booze, but also a sensei who will teach him to master his unusual gift. Soon Harry’s childhood crush, Kayla, comes and asks for help solving her father’s murder. Unsure of how it will affect him, Harry finds the strength to confront the dark secrets of the past, only to unveil the horrors of the present. 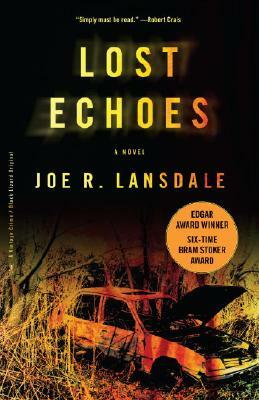 Joe R. Lansdale has written more than a dozen novels in the suspense, horror, and Western genres. He has also edited several anthologies. He has received the British Fantasy Award, the American Mystery Award, and six Bram Stoker Awards from the Horror Writers of America. He lives in East Texas with his wife, son, daughter, and German Shepherd.